People like to bash the U.S. Census this year for doling out stimulus-style ‘make-work’ jobs that don’t amount to much. But even these give away jobs aren’t being filled despite armies of unemployed Americans. In Texas, the Census is still looking for 25,000 applicants from so-called hard-to-count communities—population groups that have low participation rates in the Census due to language or cultural barriers and educational gaps, among other factors. In cities near the Mexico border such as McAllen and La Feria, hundreds of positions remain unfilled, Mr. Salinas said. Other Census offices around the U.S. are experiencing similar difficulties recruiting workers from hard-to-count communities. In certain parts of Hartford, Conn., for example, the bureau is at 40% of its recruitment goals because it hasn’t found enough workers who speak Russian, Korean and Urdu. 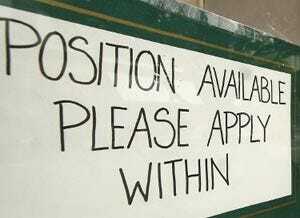 So what constitutes a job-seeking edge these days? Understanding a second language, counting, and frequenting Google Maps. Sounds like the skills many third-worlders have, perhaps they should outsource.